Metamorphosis is a complex, highly conserved and strictly regulated development process that involves the programmed cell death of obsolete larval organs. Here we show a novel functional role for the aspartic proteinase cathepsin D during insect metamorphosis. Cathepsin D of the silkworm Bombyx mori (BmCatD) was ecdysone-induced, differentially and spatially expressed in the larval fat body of the final instar and in the larval gut of pupal stage, and its expression led to programmed cell death. Furthermore, BmCatD was highly induced in the fat body of baculovirus-infected B. mori larvae, suggesting that this gene is involved in the induction of metamorphosis of host insects infected with baculovirus. RNA interference (RNAi)-mediated BmCatD knock-down inhibited programmed cell death of the larval fat body, resulting in the arrest of larval-pupal transformation. BmCatD RNAi also inhibited the programmed cell death of larval gut during pupal stage. Based on these results, we concluded that BmCatD is critically involved in the programmed cell death of the larval fat body and larval gut in silkworm metamorphosis. Insect metamorphosis is a complex, highly conserved, and strictly regulated process of developmental events. Metamorphosis is triggered by the steroid hormone ecdysone in the absence of the sesquiterpenoid juvenile hormone and is carried out by self-destructive mechanisms of programmed cell death . The developmental process of different larval tissues during metamorphic transformation showed that tissues such as the silk gland and gut are completely histolyzed [2–4], while other tissues such as fat body undergo reorganization with histolysis [5, 6], and predetermined imaginal tissues differentiate and grow into organs and external structures [4, 7]. The ecdysone-induced transcription factor Broad-Complex (BR-C) plays an important regulatory role in metamorphosis [8–14]. It is required for differentiation of adult structures as well as for the programmed death of obsolete larval organs during metamorphosis. The Bombyx BR-C RNAi disrupted the differentiation of adult compound eyes, legs and wings, and also perturbed the programmed cell death of larval silk glands . Additionally, the Bombyx BR-C function uncovers the programmed cell death of larval fat body and larval gut during silkworm metamorphosis. It is still unclear what gene products function in the programmed cell death of larval fat body and/or larval gut. Therefore, we asked whether cathepsins are involved in the metamorphic events of silkworm because, to date, studies in insects reveal that cathepsins also participate in developmental processes [2, 15–23]. Recently, a study has shown that the temporal activity profile of an aspartic proteinase is associated with fat body histolysis during Ceratitis capitata early metamorphosis . Studies of insect cathepsins strongly implicate the involvement of activated proteinases in metamorphic events. Thus, it is of interest to know whether cathepsin has any functional roles in insect metamorphosis through a loss-of-function test. Here, we have focused on cathepsin D, a lysosomal aspartic proteinase, as a metamorphosis-specific proteinase involved in metamorphic events. To help elucidate the molecular mechanisms of metamorphosis in the silkworm, we first cloned the Bombyx mori cathepsin D (BmCatD) gene from the silkworm. We examined the expression profile of BmCatD during development; BmCatD is induced by the steroid hormone ecdysone and baculovirus infection, and is expressed in a tissue- and developmental stage-specific pattern in the larval fat body of the final instar and in the larval gut of pupal stage. Finally, we demonstrate that loss of BmCatD function disrupts two classes of metamorphic events in Bombyx, larval-pupal transformation and programmed cell death of larval gut. The BmCatD cDNA was isolated by searching B. mori ESTs that encode a protein of 385 amino acids (GenBank accession number AY297160). Comparison of amplicon size between the genomic and cDNA sequences revealed the presence of nine exons and eight introns in BmCatD (Fig. 1A). The two catalytic centers and aspartic acid residues, as well as the six cysteine residues characteristic of aspartic proteinases [15, 24, 25], were conserved in BmCatD, indicating that BmCatD is a member of the same family as all other insect aspartic proteinases identified to date. BmCatD showed the closest amino acid identity with the aspartic proteinase of the mosquitoes Anopheles gambiae (64% identity) and Aedes aegypti (63% identity). However, this BmCatD gene did not align with any lepidopteran CatD gene identified to date. Characterization of BmCatD gene and protein product. (A) Genomic structure of BmCatD gene revealed by PCR amplification from BmCatD cDNA. Numbers indicate the position in the genomic sequences. GenBank accession numbers are AY297160 (BmCatD cDNA) and DQ417605 (BmCatD genomic DNA). (B) N-linked glycosylation of recombinant BmCatD expressed in baculovirus-infected insect Sf9 cells. The recombinant AcNPV-infected Sf9 cells were treated with (+) or without (-) tunicamycin and the cell lysates were analyzed by Western blot analysis. (C) Optimum pH of recombinant BmCatD. The N-linked glycosylated (solid circle) and nonglycosylated (open circle) BmCatD polypeptides were purified from culture supernatants. The pH dependency of recombinant BmCatD activity on 2% hemoglobin was assayed directly at different pHs. Cathepsin D has been reported to be an N-glycosylated high mannose glycoprotein that functions as an acidic proteinase, with an optimal pH of 3.0 [6, 15, 26]. 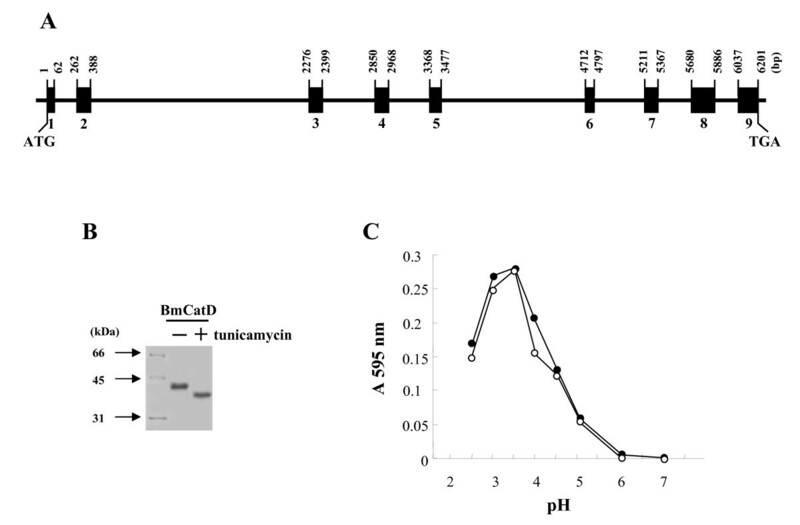 We found that recombinant BmCatD expressed in baculovirus-infected insect cells was N-linked glycosylated, but its N-linked glycosylation is not necessary for enzyme activity and that the purified recombinant BmCatD exhibited a high proteolytic activity at pH 3.0–3.5, establishing BmCatD as an aspartic proteinase (Fig. 1B,c). To examine the expression of BmCatD in various tissues during development, we first performed Northern blot analysis. We found that BmCatD was expressed in the fat body of the final (fifth) larval instar, but not in the pupal fat body, and was also seen in the gut during pupal development. Next, developmental stage- and tissue-specific profiles of BmCatD expression were performed using total RNA obtained from fat body and gut during the fifth larval instar to pupal stages (Fig. 2A). In the fat body, BmCatD mRNA was expressed from day 3 in the fifth larval instar to day 2 in the spinning stage (upper panel of Fig. 2B). On the other hand, BmCatD mRNA in larval gut was expressed during the entire pupal stage including prepupae (upper panel of Fig. 2C). The expression level of BmCatD was relatively low in the prepupal stage, increased dramatically on day 1 of the pupal stage, and thereafter gradually reduced but remained until adult eclosion. These results showed that the expression pattern of BmCatD was specifically started in the fat body on day 3 of the fifth larval instar and completely disappeared on day 1 of the prepupal stage. In larval gut, expression of BmCatD was precisely detected on day 1 of the prepupal stage, indicating that BmCatD is differentially and spatially expressed during development and its expression proceeds in a precise tissue- and developmental stage-dependent manner. Consistent with Northern blot data, the expression pattern of BmCatD protein, which was confirmed by Western blotting using the antibody of recombinant BmCatD that was expressed in baculovirus-infected insect cells, was observed in the fat body of the fifth larval instar (middle panel of Fig. 2B) and in the larval gut of pupal stage (middle panel of Fig. 2C). BmCatD expression profile and internucleosomal DNA fragmentation in the fat body and gut of B. mori. (A) Relative mRNA levels of BmCatD during the fifth larval instar to pupal stage. The level of BmCatD mRNA is calculated relative to that of the background (shown as 0%). The fat body and gut of B. mori were collected during the fifth larval instar to pupal stage (as indicated), respectively. (B, C) BmCatD expression and internucleosomal DNA fragmentation in the fat body (B) and gut (C) of B. mori. The expression level of BmCatD mRNA (upper) and its protein (middle) was analyzed by Northern blot and Western blot analyses, respectively. 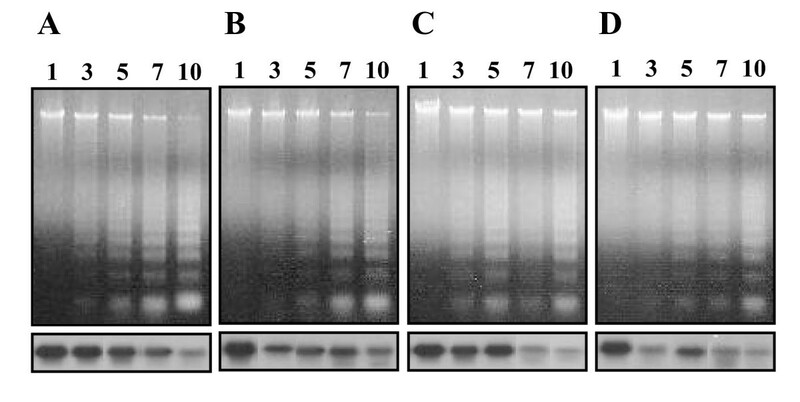 Internucleosomal DNA fragmentation in fat body and gut cells was assessed by 1.0% agarose gel electrophoresis (lower). The prospective fates of these tissues such as fat body and gut during metamorphic transformation are different. The larval gut is completely histolyzed during the pupal stage [2–4]; on the other hand, the fat body undergoes reorganization with histolysis during larval-pupal transformation [5, 6]. It seems logical that the histolysis of larval fat body and larval gut represents a programmed cell death response. Therefore, we assayed whether the histolysis of larval fat body and larval gut is accompanied by internucleosomal DNA fragmentation that is a rapid and accurate indicator of the involvement of apoptosis in cell death [6, 9]. To determine whether the BmCatD expression correlates with the histolysis of larval fat body and larval gut during metamorphosis, we analyzed the induction of programmed cell death in the fat body and gut tissues. Figure 2 also shows internucleosomal DNA fragments, seen as programmed cell death-specific laddering on agarose gel electrophoresis, for the fat body and gut during metamorphosis. The DNA fragmentation by histolysis of larval fat body was observed from day 3, peaked on day 7 in the fifth instar, and dramatically reduced on day 2 in the spinning stage (lower panel of Fig. 2B). In the larval gut, DNA fragmentation initiated on day 1 of the pupal stage and thereafter gradually increased until adult eclosion (lower panel of Fig. 2C). These results suggest that in fat body and gut, BmCatD expression was accompanied with DNA fragmentation. In addition, the DNA fragmentation rapidly and severely occurred in larval gut in the pupal stage. The result suggests that the developmental profiles of BmCatD expression, as judged by DNA fragmentation, differed between the larval gut, which undergoes programmed cell death during the pupal stage, and larval fat body, which survives into the adult phase but undergoes reorganization during larval-pupal transformation. Metamorphosis is regulated by changes in the titer of the steroid hormone ecdysone in the absence of the sesquiterpenoid juvenile hormone [1, 27, 28]. In order to determine if BmCatD expression is an ecdysone-triggered response, we examined effects of 20-hydroxyecdysone (20E) and juvenile hormone analogue (JHA) on BmCatD mRNA expression using the fat body of the fifth instar larvae. When 20E was injected into day 1 fifth instar larvae, BmCatD mRNA was clearly detected in the fat body on day 2 of the fifth larval instar (Fig. 3A-b), although no BmCatD expression was observed in the control during this period (Fig. 3A-a). On the other hand, topical application of JHA reduced BmCatD expression (Fig. 3A-c). These results show that BmCatD expression is up-regulated by 20E and down-regulated by JHA (Fig. 3B), implicating that these hormonal responses can explain ecdysone-induced expression of BmCatD in the fifth larval instar. Especially, 20E administration highly induced programmed cell death of larval fat body (Fig. 3C), indicating that the onset of larval fat body histolysis coincides with the expression of BmCatD. During insect metamorphosis, pulses of the steroid hormone ecdysone direct the destruction of obsolete larval tissues and the replacement of larval tissues and structures with adult forms . Day 3 of the fifth larval instar in the silkworm is a critical period for larval growth, and during this period, prothoracic glands begin to secrete detectable ecdysteroid [27, 28]. A pulse of ecdysone at the end of larval development triggers pupation, and the ecdysteroid activity induced by another ecdysone pulse again increases dramatically just before pupation [27, 28]. The larval silk gland and larval gut begin programmed cell death in response to an increase in ecdysteroid concentration in the pupal stage [29–31]. Taken together, our results indicate that BmCatD is expressed exclusively in the larval fat body on day 3 of the fifth instar and in the larval gut on day 1 of the prepupal stage, and suggest that the expression of BmCatD is regulated in a tissue- and developmental stage-specific manner by ecdysone fluctuations. Hormonal and viral regulation of BmCatD mRNA expression. (A) Expression profiles of BmCatD mRNA in fat body of the fifth larval instar with hormonal and viral treatments. B. mori larvae on day 1 of the fifth instar were treated with 20E (b), JHA (c), BmNPV (d) or JHA+BmNPV (e), respectively. Total RNA from fat body was extracted at 1-day intervals post-treatment and analyzed by Northern blots. The control was the untreated larvae (a). BmNPV p35 (f) gene serves as a marker of viral infection. (B) Relative mRNA levels of BmCatD regulated by treatment. The levels of BmCatD mRNA are means of three assays, which are calculated relative to that of the expression recorded for the control (shown as 100%). Bars represent the means ± SE. Significance of the differences versus a control value is given by ** (P < 0.01) and * (P < 0.05). (C) Internucleosomal DNA fragmentation in the fat body of the fifth larval instar with hormonal and viral treatments. DNA from the fat body cells of all treated larvae was extracted at 1-day intervals post-treatment (as described in A), respectively. DNA fragmentation was assessed by 1.0% agarose gel electrophoresis. Host insect infection with baculovirus induces metamorphosis [32, 33]. This raises the possibility that BmCatD may be involved in the induction of metamorphosis of host insects infected with baculovirus. To examine this possibility, we carried out transcriptional induction analysis of BmCatD in baculovirus-infected silkworm larvae. When BmNPV was injected into larvae on day 1 of the fifth instar, BmCatD mRNA was detected in the fat body on day 2 of the fifth larval instar (Fig. 3A-d), although no BmCatD expression was observed in the controls (Fig. 3A-a). Consistent with this, the induced programmed cell death of larval fat body by viral infection was clearly observed on day 2 of the fifth larval instar (Fig. 3C). Furthermore, the level of BmCatD expression was found to be higher in virus-infected larvae than in uninfected controls (Fig. 3B). 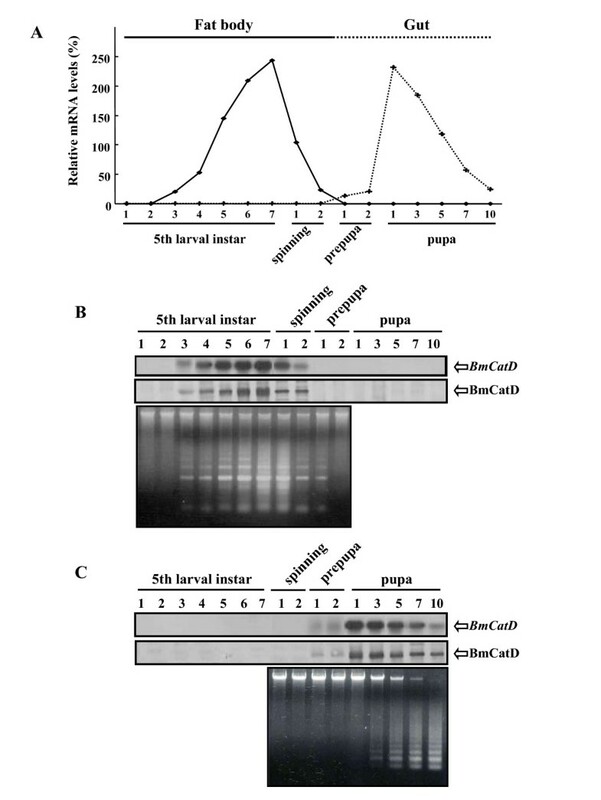 This result indicates that viral infection induced the BmCatD expression, which resulted in the induced programmed cell death in larval fat body, and suggests that BmCatD was involved in the induction of metamorphosis in the host insect infected with baculovirus. During virus replication, the prothoracic gland of host insects was observed to maintain characteristics indicative of ecdysone biosynthetic activities . The haemolymph ecdysteroid level and prothoracic gland activity in baculovirus-infected larvae were higher than in controls, which continued until the late stages of viral infection, even during the time that controls had ceased to secrete ecdysone after molting [32, 33]. Thus, these observations indicate that viral infection resulted in the up-regulation of BmCatD, as shown in 20E treatment, and suggest that BmCatD up-regulation is the result of alteration of host's hormonal system by viral infection. To further understand the correlation between hormonal system and viral infection, we injected larvae on day 1 of the fifth instar with Bombyx mori nucleopolyhedrovirus (BmNPV) just after JHA treatment, which down-regulates BmCatD expression. Interestingly, in both JHA and BmNPV treatments, BmCatD expression was up-regulated in a viral infection-dependent manner (Fig. 3A-e), thus indicating that viral infection plays a role in the regulation of BmCatD expression, regardless of the presence or absence of JHA. The host's hormonal system, altered by viral infection, induces metamorphosis [32, 33], which suggests that metamorphosis induction due to virus infection functions as a viral defense system of the host insect. In contrast, baculoviruses are known to contain the unique p35 gene, which blocks virus-induced apoptosis . Therefore, the inhibition of DNA fragmentation at later stages of viral infection (Fig. 3C) was likely due to P35 of BmNPV. This result was consistent with previous observations indicating that baculovirus infection blocks the progression of fat body degradation . It is known that in the fat body of insects, the lysosomal system is involved in cellular remodeling, which is associated with metamorphosis and termination of egg maturation cycles [6, 15, 36, 37]. However, there has been relatively little research into the substantial functional role of CatD in metamorphosis in insects, especially in Lepidoptera. Therefore, we next asked whether BmCatD is functionally involved in the metamorphosis of the silkworm, and whether silkworms have any defects in the BmCatD RNA interference (RNAi) process. In order to determine the functional role of BmCatD in silkworms during metamorphosis, we reduced the endogenous BmCatD mRNA levels in the fat body of silkworm larvae by using RNAi, and then confirmed the reduced BmCatD mRNA levels by using Northern blot hybridization. 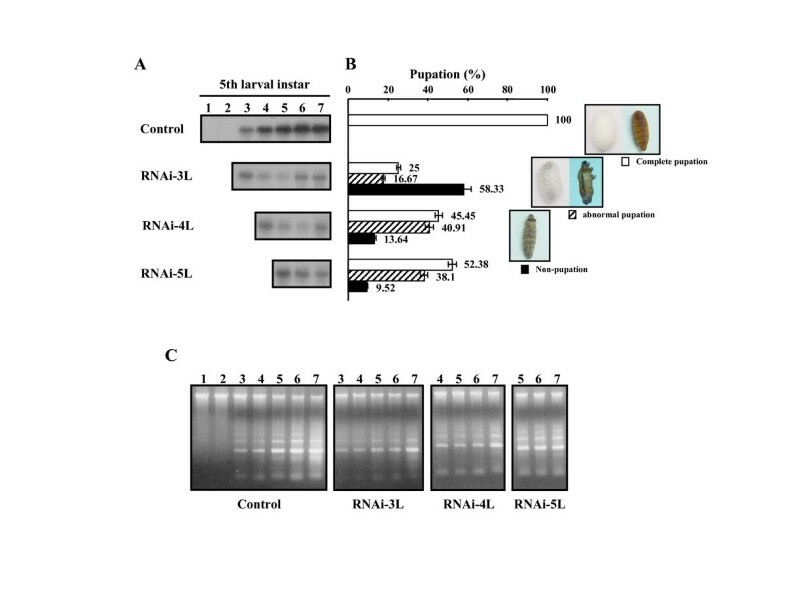 BmCatD mRNA levels in fat body of BmCatD RNAi-mediated silkworm larvae were significantly reduced compared to the control silkworm larvae (Fig. 4A). To characterize the functional role of BmCatD in silkworm larvae, it is important to obtain silkworm larvae containing little or no BmCatD. This approach relies on the degree of BmCatD reduction caused by RNAi, as a measure of RNAi function, in order to explore the proposed role of BmCatD in silkworm larvae. Effects of BmCatD RNAi on B. mori development. (A) BmCatD expression profile in RNAi-mediated B. mori larvae and controls. BmCatD dsRNA was injected into larvae on day 3 (RNAi-3L), 4 (RNAi-4L) and 5 (RNAi-3L) of the fifth instar, respectively. The control was the untreated larvae. Total RNA from the fat body was extracted at 1-day intervals post-treatment. The expression level of BmCatD mRNA was analyzed by Northern blot analysis. (B) Pupation rate in RNAi-mediated B. mori larvae and controls. The pupation rates are the means of three assays. Bars represent the means ± SE. (C) Internucleosomal DNA fragmentation of the fat body in RNAi-mediated B. mori larvae. DNA from the fat body cells of all treated larvae was extracted at 1-day intervals post-treatment (as described in A), respectively. DNA fragmentation was assessed by 1.0% agarose gel electrophoresis. In BmCatD RNAi-mediated silkworm larvae, larval-pupal metamorphosis was strongly affected by BmCatD RNAi. Compared to controls, all of which underwent regular larval-pupal transformation, three-fourths of BmCatD RNAi on day 3 fifth instar larvae arrested during larval-pupal metamorphosis (Fig. 4B). In this case, a large portion of BmCatD RNAi-mediated silkworm larvae was nonpupated (58.3%) and 16.7% of larvae were abnormally pupated. Similar effects were respectively seen in 55% and 48% of BmCatD RNAi on day 4 and 5 fifth instar larvae, and the abnormal pupation rate was relatively high in these cases (Fig. 4B). The arrest of larval-pupal transformation was observed in BmCatD RNAi-mediated silkworm larvae and indicated that BmCatD is necessary for the larval-pupal metamorphosis in the silkworm. It is formally conceivable that BmCatD might have additional functions in other developmental processes, and reduction in BmCatD via RNAi in these processes might directly or indirectly contribute to developmental arrest. We next tried to determine whether BmCatD could induce DNA laddering in larval gut during pupal development. To provide evidence that BmCatD is involved in programmed cell death of larval gut, we also reduced the endogenous BmCatD mRNA levels in the gut of silkworm pupal stage by using RNAi and then examined the pattern of DNA fragmentation in the larval gut. As observed from the Northern blots (lower panels of Fig. 5), BmCatD levels were reduced in the larval gut of BmCatD RNAi-mediated silkworm pupae. Compared to controls, which undergo rapid and severe DNA fragmentation in the larval gut from day 3 of the pupal stage, BmCatD RNAi-mediated silkworm pupae exhibited an inhibition of DNA fragmentation in larval gut (upper panels of Fig. 5). When BmCatD dsRNA was injected repeatedly into pupae on day 1 and 5 of the pupal stage, the inhibition of DNA fragmentation in larval gut was more clearly affected. These results indicate that loss of BmCatD causes a defect in internucleosomal DNA fragmentation of larval gut, pointing to an important role of BmCatD in programmed cell death of larval gut. Internucleosomal DNA fragmentation of the larval gut in RNAi-mediated B. mori pupae. BmCatD dsRNA was injected into pupae on day 1 (B), 5 (C) or both 1 and 5 (D) of the pupal stage, respectively. The control was the untreated pupae (A). DNA was extracted from the gut on day 1, 3, 5, 7, and 10 of the pupal stage (as indicated), respectively. DNA fragmentation was assessed by 1.0% agarose gel electrophoresis (upper). Total RNA from larval gut was extracted as above. The expression level of BmCatD mRNA was analyzed by Northern blot analysis (lower). As judged from the observed effect of BmCatD RNAi during metamorphosis, all observations in this study provide strong evidence that BmCatD was involved in the histolysis of larval fat body and larval gut, demonstrating a functional involvement as a metamorphosis-specific lysosomal proteinase. Recently, most studies of molecular mechanisms of metamorphosis in silkworm have focused on the metamorphosis-specific transcriptional factor BR-C [4, 38–40]. It has been shown that the Bombyx BR-C is expressed in an ecdysone-induced manner and is required for programmed cell death of larval silk glands, as well as for the differentiation of adult structures including compound eyes, legs, and wings . By focusing our findings on the BmCatD, we have been able to explain metamorphosis-specific functions of BmCatD. The work provided here demonstrates the involvement of cathepsin D as a metamorphosis-specific proteinase in metamorphic events. This finding is important in that it sheds new light on the functional role of cathepsin D in silkworm metamorphosis. The metamorphic defects seen in the BmCatD RNAi-mediated silkworm, such as larval-pupal transformation arrest and programmed cell death inhibition, highlight an important functional role of BmCatD in metamorphic processes and provide a foundation for a better understanding of the molecular mechanisms of insect metamorphosis. Larvae of the silkworm, Bombyx mori, used in this study were F1 hybrid Baekok-Jam supplied by Department of Agricultural Biology, The National Institute of Agricultural Science and Technology, Korea. Silkworms were reared on fresh mulberry leaves at 25°C, 65 ± % relative humidity, and 12 h light: 12 h dark photoperiod. Spinning (wandering) occurred on day 7 of the fifth instar, and pre-pupation and pupation occurred 2 days and 3 days thereafter. The first days corresponding to the developmental stages of the fifth larval ecdysis, spinning, and pupation were designated as day 1 of the fifth larval instar, spinning, and pupal stage, respectively. The BmCatD cDNA was cloned from a cDNA library using whole bodies of B. mori larvae . The sequences were compared using the DNASIS and BLAST programs provided by the NCBI . MacVector (ver. 6.5, Oxford Molecular Ltd) was used to align the amino acid sequences of CatD. Genomic DNA, extracted from the fat body of single B. mori larva using a Wizard Genomic DNA Purification Kit (Promega), was used for PCR amplification with oligonucleotide primers designed from the BmCatD cDNA sequences. The nucleotide sequence was determined as described previously . A baculovirus expression vector system , using the Autographa californica nucleopolyhedrovirus (AcNPV) and an insect cell line Sf9, was employed for the production of recombinant BmCatD protein. Recombinant BmCatD purification, antibody preparation, and Western blot analysis were performed as described previously . The loading volume of protein samples in all Western blot analyses was 5 μg/lane. Tunicamycin treatment was performed as described previously . Aspartic proteinase activity of BmCatD was measured as described previously . Total RNA was isolated as described . Northern blot and its image analysis were performed as described previously . The loading volume of total RNA in all Northern blot analyses was 5 μg/lane. DNA fragmentation from larval fat body and larval gut was assayed using an Apoptotic DNA-Ladder Kit (Roche Applied Science, Germany) according to the manufacturer's protocols. DNA was analyzed on a 1.0% agarose gel and visualized by ethidium bromide staining. Twenty-hydroxyecdysone (20E, Sigma) was dissolved in distilled water and stored at -20°C until used. Twenty micrograms of 20E dissolved in 20 μl of distilled water was injected into B. mori larvae on day 1 of the fifth instar. Fifty nanograms of a juvenile hormone analogue, fenoxycarb (Sankyo, Japan), dissolved in 20 μl of acetone were applied topically to larvae with a micropipette along the dorsal midline. For viral infection, BmNPV [44, 46] was suspended in TC100 medium. B. mori larvae on day 1 of the fifth instar were injected with 50 μl of a viral suspension (1.0 × 105 PFU/larva). The fat body from all treated larvae was collected at 1-day intervals post-treatment and washed twice with PBS. Total RNA and genomic DNA were isolated from the tissues as described above. For injection in experiments, larvae of B. mori were injected with a sample solution between the first and second abdominal segments with a microsyringe. Each assay was replicated three times based on three independent tissue preparations. For comparison of relative BmCatD mRNA levels, statistical analysis of images of Northern blots was performed with Tukey's pairwise comparison test. Results are shown as mean ± SE of three animals per group. Significant P values were obtained by Tukey's test. The MEGAscript RNAi kit (Ambion) was used to generate double-stranded RNA (dsRNA) corresponding to nucleotides 226 to 741 of the BmCatD cDNA. T7 promoter sites were added to the PCR primers BmCatD-Fi (5'-GCGTAATACGACTCACTATAGGGAGACCGCAGTCGTTCAAGGTGGTA-3') and BmCatD-Ri (5'-GCGTAATACGACTCACTATAGGGAGAGAACTCCCAGTACGTGTCCCG-3'). PCR reactions were conducted to generate complementary templates with a single T7 promoter site. T7 RNA polymerase was used to transcribe single-stranded RNA (ssRNA) from each DNA template over 4 h at 37°C. BmCatD dsRNA was produced by mixing solutions containing equal amounts of complementary ssRNA, incubating at 75°C for 5 min, and allowing the solution to cool down to room temperature. DNA and ssRNA were removed from the solution by digestion with DNase I and RNase at 37°C for 1 h. The dsRNA was purified using purification cartridges provided in the kit and dsRNA was eluted with two successive 50 μl washings of pre-heated (95°C) 10 mM Tris-HCl (pH 7.0) containing 1 mM EDTA. Finally, total dsRNA was quantified from the A260. BmCatD dsRNA (≈1 mg ml-1) was injected into larvae or pupae of B. mori (injection volume ≈50 μl/individual) using a sterile needle. After injection, all individuals were covered with paraffin. Zhong Zheng Gui, Kwang Sik Lee contributed equally to this work. This work was supported by a grant from the Biogreen 21 Program, Rural Development Administration, Republic of Korea and the Brain Korea 21 Project, the Ministry of Education, Republic of Korea. ZZG and KSL carried out most of the experiments in this study. BYK and YDW participated in the RNAi and DNA fragmentation assays. YSC and YMC assisted with cell culture, protein purification and antibody production. PDK carried out silkworm rearing. HJY and HDS assisted with the physiological characterization of the silkworm. IK helped to draft the manuscript. 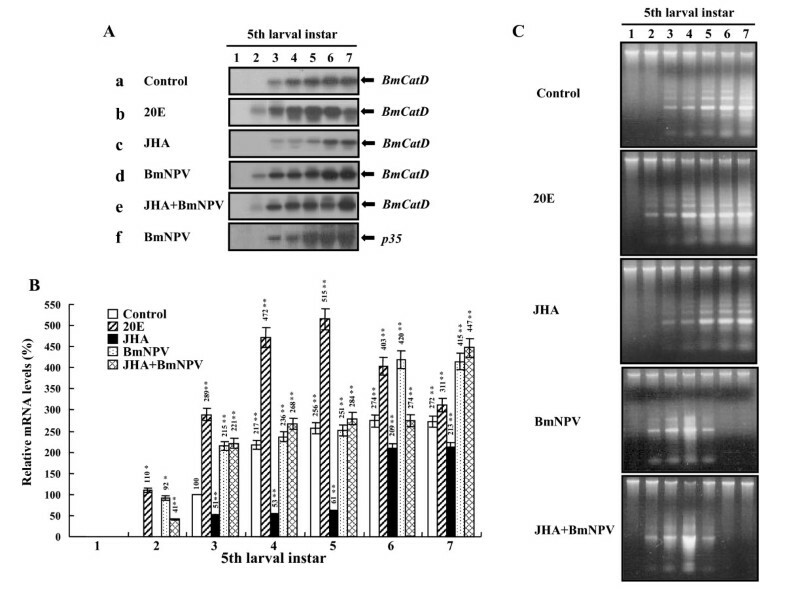 YHJ helped with the baculovirus expression vector and protein expression. SJS, SML, and XG assisted with the analysis of results. BRJ was responsible for the experiment design, analysis and interpretation of data and writing of manuscript. All authors approved the final manuscript.